A drama unfolded on our ceiling recently which highlighted the power of silk that some spiders use. 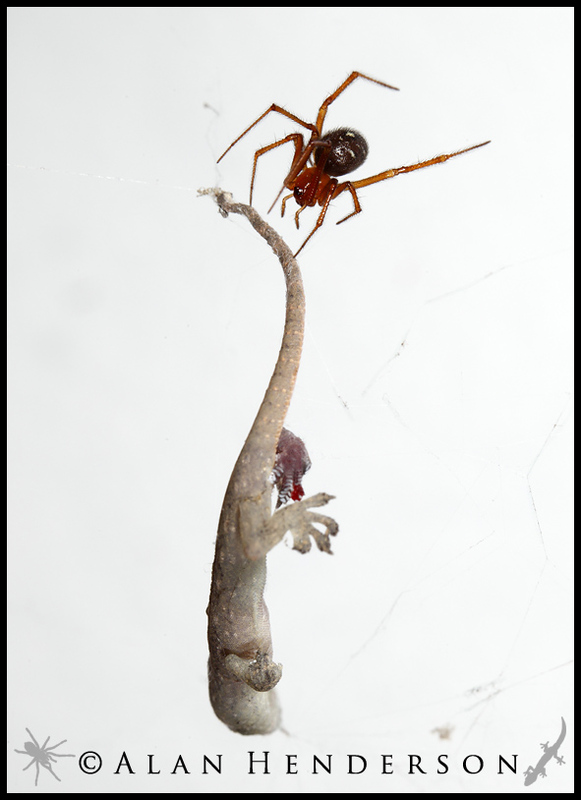 A Red House Spider (Nesticodes rufipes) capture and killed an Asian House Gecko (Hemidactylus frenatus) much larger than itself, and it did so using silk as its major tool. Several hours later and the gecko has seccumbed to the spider's venom and the spider has begun feeding. This spider belongs to the family Therididae, which also includes well known species such as the Redback and Black Widow. Many of the spiders in this family utilise a particular snare system that enables them to capture very large prey. One of the key parts of the snare is high tension trip lines that are beaded with blobs of liquid silk. When prey makes contact with these lines it is bound by the glue-like silk and becomes tethered. Any struggles often result in it making contact with more lines, and subsequently in more trouble. At this point the spider descends from the scaffold of silken threads which support the trip lines, and using its long rear legs begins to bind the prey with lines coated with the glue-like silk. For most animals, there is little chance of escape from here on. Only when the prey is safely manacled with dozens of silken lines does the spider venture close enough to bite its victim, which begins the chemical onslaught inside its body. A Redback (Latrodectus hasselti) in the process of binding a large Tenebrionid beetle. A Redback with a bound up huntsman, over 10 times its own body weight.